Forgive me for showing one of my own posters again. I thought this was a good follow-up to last week’s post on logos, because one of the things I wanted to do with this poster was to subvert the way most people do titles. I wanted to turn that prime top left corner into an entry point or highway sign by putting the most immediately recognizable image that was relevant to the research. 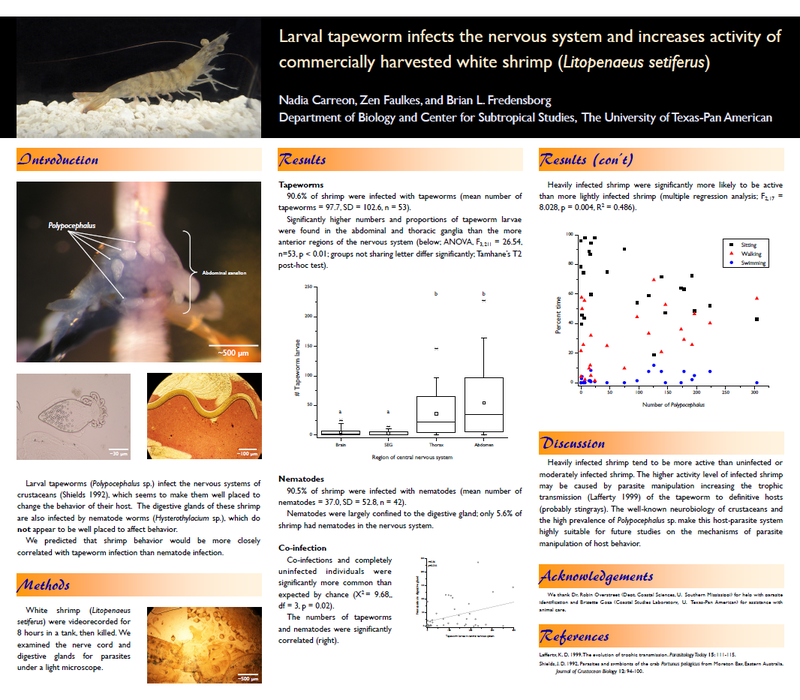 Strictly speaking, the poster is more about the parasites inside the shrimp than the shrimp itself, but people know what a shrimp is. Because the background of the picture was solid black, that gave me the idea to make the title space a distinct black banner. I’d wanted to try an orange and blue colour scheme ever since I’d written a blog post about orange and blue on movie posters. But I wouldn’t have done it if I hadn’t come by it honestly: the staining technique I used for the first picture in the introduction gave me orange and blue! Two of the other pictures were orange-ish colours, so it made for a surprisingly consistent colour scheme. I carried the colours through in the section headers, the data points in the graphs, and the title. Those may be too subtle in the last two, though. This poster is great. 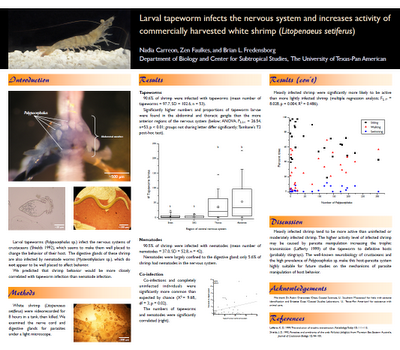 I love the way the shrimp picture lines up perfectly with the column below it.